In fact, I think it’s at the lowest price: a pack with probably about 10 small cones of incense sandalwood cost about RM1.90- bought about few years ago by me. I am sure the price would not have increased much. If you have bought from souvenior shops or the prepacked ones, it would be sold few or many times the price. Well, you can actually buy an assortment and take back and have them mixed yourself. Above are sandalwood sticks- just lighting one stick would fill the entire room with a strong sandalwood smell. It’s much stronger compared to the Chinese prayer jossticks. Above is the sandalwood made from neem leaves- I usually burn it to cleanse the environment- and place in corners or below the bed when we are doing springcleaning. I was told by my friend that it would help to remove negative energies. 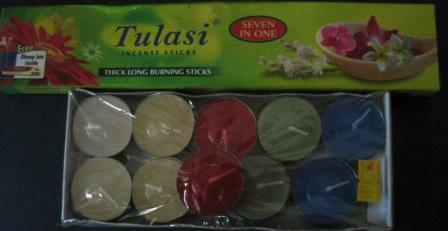 Above are the tulasi burning sticks. 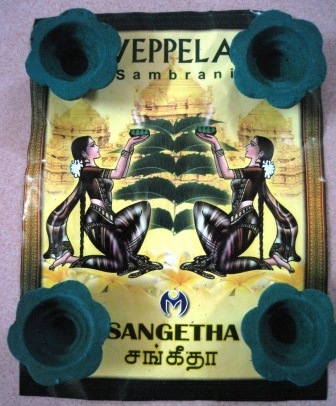 For most of them, I had bought from New Malliga located in Brickfields.